Antibacterial – Bamboo fabric has many antibacterial qualities that it retains through multiple washes. This helps to reduce bacteria that thrive on clothing causing unpleasant odours. It can also kill odour causing bacteria which live on the human skin making the wearer and the clothes smell sweeter. Better Wicking – Bamboo fabric has 3-4 times more wicking capability, pulling the sweet away from the skin and evaporating it faster than cotton. Along with the natural breathability of the fabric this makes it dryer, more comfortable and means it does not stick to your skin. Thermo Controlling – (Air conditioned clothing), the breathability ensures that you stay cool in hot weather. You also stay warmer in cool weather due to the way the fabric is weaved, trapping warm air next to the skin. Strength – Bamboo is a very strong natural fibre making it durable and longer lasting (it is so strong that in Asia bamboo is widely used for scaffolding). UV Protective – It cuts out 98% of harmful rays making it perfect for hitting the slopes or a game of something on the beach. Sustainable – Our bamboo is 100% naturally grown and 100% sustainable. Bamboo can grow in areas that other plants cannot. As the fastest growing plant in the world there is an abundance of resources and stocks are quickly replenished. Bamboo is also known for improving the soil quality in arid and eroded areas. No Chemicals – Bamboo thrives naturally and is not affected in the same way as many plants by pests, therefore the environmentally unfriendly use of herbicides, pesticides and fertilisers is not required. No Added Water – The production of bamboo does not require any additional water and just relies on rainfall. By contrast, cotton requires a huge amount of additional water, through irrigation, to produce equivalent yields. 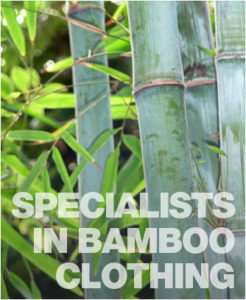 Yield – The yield for bamboo is 10 times greater per acre than that of cotton. In a time where land use is under extreme pressure, this is of huge environmental benefit.